Greetings! Mother nature has served up a roller coaster of a season. We certainly had some awesome stretches of winter weather. Unfortunately, we also had our share of warm-ups and that dreaded “R” word. However, when the weather permitted, we had some fantastic regional riding and we hope folks were able to get out and enjoy the trails. Even though March has delivered some epic snow storms, we are certainly on the backside of our season. I would like to give a shout out to all of our volunteers who have spent countless hours on equipment maintenance, grooming, trail work, administrative duties, fundraising, etc… Our trails were in great shape this season and certainly reflected the hard work that was put into them. I would also like to give a big “Thank You” to all of our landowners. Without you, we wouldn’t have this great sport we all love. As we approach the end of the season, there are a few upcoming events still happening within BMSD. Our annual meeting is in May and is traditionally a potluck dinner where we vote in our officers and directors for next year’s season. Grantham’s Old Home Day is typically held on (or near) July 4th and features a parade we’ll look to participate in. We are also planning our annual golf tournament in August. This year it will be held at the Twin Lake Village Golf Course in New London. 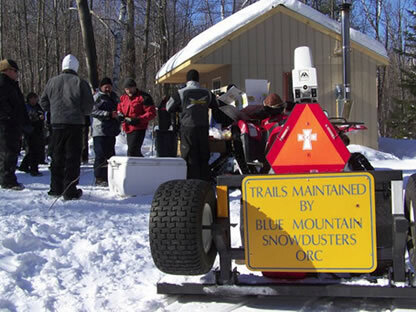 I would encourage folks to keep an eye on both our web page (www.snowdusters.org) and Facebook page as more information becomes available regarding these events. Greetings fellow riders and friends! It has been a busy pre-season for us here at BMSD. Trails have been cleared and signed. Annual maintenance on the Tucker and Skandics have been completed. Landowner forms have been updated and fall GIA projects have been finished up. A big Thank You to all of our volunteers who have helped prep for the season. Our trail network would not be possible without your support and dedication. Now we just have to add snow. Hopefully Mother Nature has given us a preview of what the upcoming season is going to be like. A couple of notes as our season ramps up. The town logging project that was planned along Corridor 5 in Grantham between 4 Corners and Chase Pond has been postponed. There will be no need to re-route sled traffic off of the Corridor trail. Our second annual sled dog race has been scheduled for February 16th. This event will begin at the Grantham Rec. Fields and traverse through the local trail networks. We had a huge spectator turnout last year and our club received a lot of positive feedback for the overall event. Please check our Facebook page and website for updates as the race draws closer. BMSD meetings are held the first Thursday of each month at 6:30pm at the Grantham Town Hall. Please stop by to meet your fellow members and find out about what goes on behind the scenes to make our local trail network a great place to ride. See you on the trails!